Snacking gets a bad rap. Some kids snack too much. Some kids choose the wrong kind of snacks. And, it’s true that some parents don’t have a good strategy when it comes to snacking. Too much snacking and choosing unhealthy snacks can sabotage a child’s weight and overall health. On the other hand, it’s also true that healthy snacks can be a strategic benefit to a child’s overall nutrition. For example, kids need 40 different nutrients and without them, it’s hard to meet all the nutrients a child needs to grow and develop properly. Snacking can also help moderate excessive eating. When kids get regular meals and snacks offered at predictable times throughout the day, they may have better control of their appetite and avoid overeating. Unfortunately, for many kids, snacks are NOT working. Part of this is the type of snack food they are eating, but the other factor is the lack of strategy behind them. 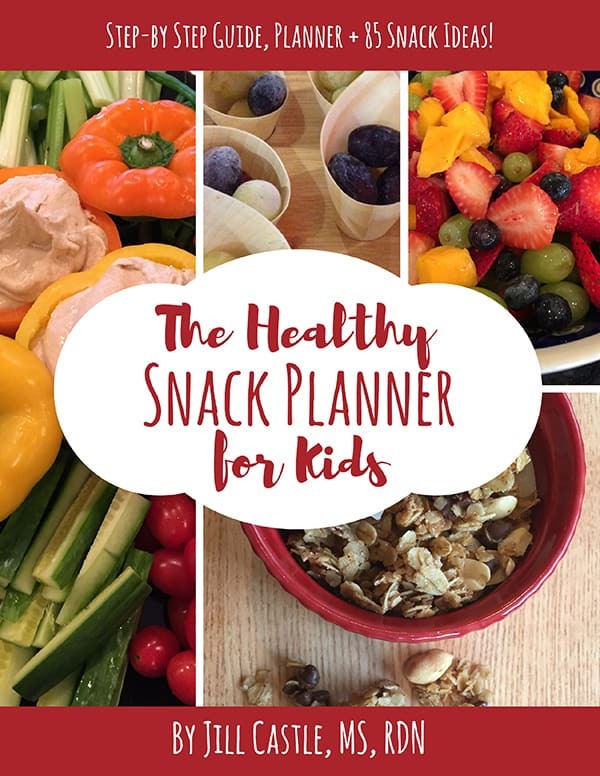 Children snack about four times per day, and snacks account for 27% of a child’s total caloric intake, according to a large survey of US children published in 2010. On average, kids reach for cookies, chips and other treats most often, which total up to about 600 calories per day (168 more calories than the average snacker in the 1970s). Think your child is eating all day? Well, he might be, as this report draws attention to the fact that some children are eating up to 10 times a day. Two to six year olds show the highest increase in snacking, consuming an extra 182 calories per day compared to their same age counterparts from the ‘70s. The study also suggested that kids are eating less at meals and more from snacks, tipping the balance toward unhealthier food choices. The good news? According to a 2015 report from Mintel, a marketing research firm, about 30% of parents are serving healthier snacks to their kids. Health quality, convenience and reusable packaging are emerging factors that influence snack choices. Does Your Child Really Need a Snack? As children are growing and developing, they need a blend of nutrients to get this job done. From protein and carbs to calcium and iron, kids need a routine with regular meals and snacks so they get these nutrients day to day. I advocate for snacks in kids’ diets. I believe it helps them meet their nutrient requirements while also helping to regulate their appetite and eating. The key to successful snacking lies in what kids eat as snacks, and the timing of eating. In other words, you need to have a good, working snack strategy. The trends in kids’ snacking suggest junk food and sweets are the norm. We need to turn this around and focus on whole foods that serve up fiber, protein and fat. These key nutrient components have a magical quality: they induce fullness. A 2016 study in Advances in Nutrition highlighted the beneficial role of snacks on a child’s satiety, or sense of fullness after eating. Teasing out nutrients that helped kids feel full, specifically protein, fiber and healthy fats, is the name of the game. Researchers found serving up whole foods which contained protein, fiber, and whole grains such as nuts, yogurt, prunes, and popcorn, enhanced a child’s fullness after eating them. Your child could eat the healthiest foods on the planet, but if he is eating them all day long, that isn’t healthy. Timing is everything. The key is in creating a structure that moderates the frequency of snacking. Depending on the age of your child, the timing of snacks will reflect the physiologic capacity of her tummy. Little people need small portions and frequent eating, as their tummies don’t hold a lot and become empty earlier than a bigger kid. Alternatively, a big kid can eat larger amounts of food and stay full longer because his tummy can hold more food. The mistakes I see being made around snacking centers around poor food selection or bad timing. Kids eat too many unhealthy foods like sweets. They get these foods on the sporting fields, in the classroom, and at home. Or, they eat snacks all day long, or they have both factors at play. If you want to raise a healthy snacker, you must address both the food content of the snacks and the frequency of eating them. Tell me, do you have a winning snack strategy? Milk Nutrition Showdown: Which One is Best for My Child?